Christmas Pearmain - Apple Tree £12.75 - Dessert Apples - Late Season Apple Trees and Fruit Trees For Sale. Buy at competitive prices with wholesale discounts. 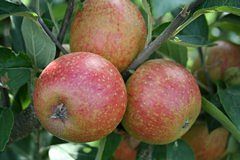 Christmas Pearmain is sweet, crisp and juicy eating apple, that possesses yellow flesh and russetted skin. The tree itself is reliable and disease resistant. Christmas Pearmain was found in Maidstone in 1893.